Being a wine writer (say those two words fast ten times) has its good moments, and I’m grateful when they happen. Occasionally, I have the opportunity to taste product from wineries that are new to me and otherwise might go inexperienced. Some is good. Some goes unmentioned in my blog. And then – not too often – some send me into a state of wonder and joy. Such is what happened recently when I tasted Left Bend’s 2010 inaugural release of their Syrah. Left Bend’s Syrah is definitely “new world” (with no percentage of Viognier), but even unique among “new world” Syrah wines. 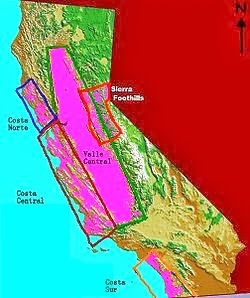 Fruit comes from the Black Ridge Vineyard three miles outside of Los Gatos California in the Santa Cruz Mountains AVA (see map). The AVA was recognized in 1981 and encompasses approximately 322,000 acres, a small percentage of which is planted with grapes. What makes wine from Santa Cruz Mountains so interesting is the region’s many micro climates, each created by the elevation, the side of the mountain on which the vineyard is established, its sun exposure, soil type, the effects of fog and more. Grapes for Left Bend's Syrah grow at an elevation of 1,000 feet. The vineyard is protected from the harsh coastal winds and lingering fog to benefit from a full day of sun enhanced by the Lexington Reservoir a half-mile below. At night, cool air spills down the mountainside and this diurnal temperature change produces fruit ripe in flavor and acidity. But as with all wine, the magic needs to continue at the hands of the winemaker if the end result is one that produces joy and wonder. In the glass, Left Bend’s 2010 Syrah is dark ruby, or what a gemologist evaluating a ruby would call “pigeon blood.” (Animal rights activists: don’t complain to me. That’s the term). The nose is very pleasant with notes of earth and blackberry with hints of dark cherry and raspberry. Swirl then sniff again and cocoa becomes evident and the blackberry more pronounced. The taste, after all, is what wine is all about and in that, this Syrah is most interesting. I tasted without decanting or aeration and enjoyed squashed blackberry – jam like – and hints toward dark cherry and blueberry. Light-medium body with seemingly smoothed tannins, Left Bend’s Syrah had a pronounced pepper back taste. The finish produced warmth in the mouth which at 14.4 % alcohol could be attributed to the percentage of alcohol, though I've had other Syrahs of equal strength with no such effect. The initial taste seemed, for me, just slightly thin though that quickly changed as the wine continued to develop in the mouth toward its long peppery finish. Finish however, is not something I did with this bottle. I wanted to taste this wine again and better sense its development (or lack of) overnight. So I vacuum pumped the bottle, kept it cool over night and continued my hard work the next day. What happened was nothing short of a transfiguration! Given some air, this wine opened up and became silky, the pepper less pronounced (fine with me), the finish extended, the body richer and with more depth. While more powerful, the wine was also better balanced. We all have our own definition of what makes for excellent wine. And if there’s a secret to liking the reviews of any writer, I think it’s finding one whose taste preference simply matches your own. For me, balance in a wine is paramount, but not commonly achieved. Yes, Virginia, we get it: Pinot Noir can have smoke and Chardonnay can offer buttery vanilla. But I’m in it for the grace notes, the seductive invitation that intrigues, mystifies and invites one to taste again. I’m intrigued by a wine that doesn't beat my senses with a flavor mallet but instead challenges me to discern its offerings by having them so well integrated that the sum is so much better than its parts and therefore difficult to describe. All the elements remained present: the black fruit, the blueberry, the pepper finish. But they played together in a beautiful symphonic composition. For me, Left Bend’s inaugural Syrah began as a good wine and finished as a magnificent composition and it was a wondrous and joyful tasting experience. I haven’t been so intrigued by a Sirah since I first tasted “Relentless” (a proprietary blend of Syrah and Petite Sirah which cost twice as much and has since been selected by Wine Spectator this year as one of their top 100 wines). In the meantime, I’m awarding Left Bend’s Syrah 4 glasses, my highest rating, while waiting for Left Bend’s Syrah to be so discovered. If you’re intrigued enough to invest $35, I suggest you order direct from the winery. With production limited to 65 cases (not barrels) you’re unlikely to find this at retail. * Sample was provided by winery for review.